A group of underwater researchers has found a 3,600-year-old Bronze Age shipwreck, which could be the world's oldest shipwreck, off the shores of southern Turkey's Antalya province, the provincial governor's office said Monday. The shipwreck, estimated to date back to 1600 B.C., was discovered off the western shores of the ancient greek city by Antalya University's Underwater Research Department. Speaking to reporters, Governor Münir Karaloğlu described the discovery as groundbreaking for the field of underwater archaeology, saying that the newly discovered shipwreck, which was named the "Western Antalya Shipwreck", was the "Göbeklitepe" of the underwater world. Şanlıurfa's archaeological site Göbeklitepe houses the oldest known temple in human history and is often referred to as ground zero of human history. Karaloğlu said the artifacts that will be removed from the wreck will be displayed at a museum in Kemer district, which will become "the epicenter of underwater archaeology." Stating that copper bullions were the main find in the wreck, Hakan Öniz, one of the researchers from Antalya University, noted: "From the typology of the bullions, we determined that the shipwreck was one of the merchant vessels of the 16th century B.C. It has broken fresh ground in underwater archeology thanks to these findings." The number of visible bullion the ship once carried was determined through three-dimensional scans of the shipwreck obtained via sonar surveys, photographic mosaic and photo-scan work. "It was probably caught in the middle of a storm while traveling to the Aegean [northwest of Antalya] region from Cyprus [south of Antalya]. It was carrying a cargo of copper bullion and type of that bullion helped us date the ship. This may well be world's earliest vessel carrying industrial goods," Öniz said, adding that they would now form a team with local and international researchers for a five-year project to further investigate the wreck. Previously, a shipwreck dating back to 1400 B.C. was found off the shores of Antalya, which was the oldest of its kind until this recent discovery. 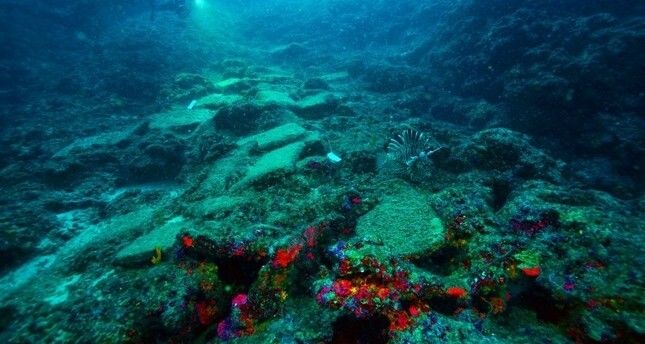 The antique shipwreck had been named the "Uluburun Shipwreck" after the location it was discovered in. The artifacts found in the wreck are currently on display at the Museum of Underwater Archaeology in Muğla's Bodrum district.